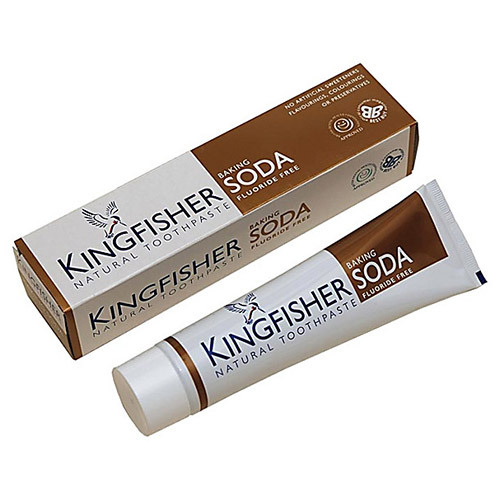 Kingfisher Baking Soda Toothpaste is a smooth fluoride-free toothpaste containing no artificial sweeteners, flavourings, colourings or preservatives. The natural lightening and brightening formula is flavoured with real peppermint and spearmint. The gentle abrasive action gently lifts debris from the teeth, keeping your mouth and gums healthy. Kingfisher was the first natural toothpaste to receive the important approval of the British Dental Health Foundation. The BDHF recommend Kingfisher as an effective way to help keep teeth and gums clean and healthy, and help to prevent tooth decay. They recognise it as a valuable aid to achieving good oral health. Glycerin (Vegetable), Sodium Bicarbonate, Aqua (Purified Water), Calcium Carbonate, Sodium Lauroyl Sarcosinate (Palm Oil), Cellulose Gum, Mentha Piperita (Peppermint), Mentha Viridis (Spearmint), Limonene. Brush teeth thoroughly, at least twice a day, or as directed by a dentist or physician. Supervise children as necessary until capable of using without supervision. Children under 6 years of age: use a pea sized amount. Below are reviews of Kingfisher Baking Soda Toothpaste - 100ml by bodykind customers. If you have tried this product we'd love to hear what you think so please leave a review. My teeth feel very clean after using but I think the baking soda is a little strong (or some other ingredient) as it leaves my lips quite sore and nippy afterwards and I never usually experience this.